This is advanced feature & heavily affects gameplay. But it's also very interesting & satisfying. !! Please read description !! Why Army Supplies Costs modification ? It should be rather obvious. Army supplies are a key factor for large armies & campaigns for quite big period of time, already for 2 000 years at least. Lack of proper supplies was often a key factor of large campaigns failures, and successful supplies was often a key factor of success. Its worth to mention BGR advanced mod for Stainless Steel as an example in this topic. BGR:V is not compatible with SSHIP, so I've created some similar but not so advanced and not so complicated modification. How it works in general ? 'Army Supplies Costs' requires that named general is commanding army (is present in army stack). In most cases player & AI will give commander to more important armies. small costs (1/20 of full cost) is applied for armies leaded by captains, but there's no technical possibility to determine size of such army. 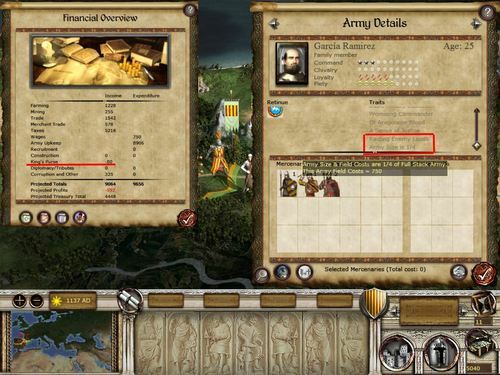 Default 'Full Size Full Cost' (parameter in options) - cost for full size army on long campaign in enemy territory (InEnemyLands level 3) is 3 000 florins. So, half stack army with general on quick raid in enemy territory (first / second / third … turn) will be charged as 3 000 x 1/2 (army size) x 1/4 ( level 0 of 3). Technically it's little more complicated (many generals in army, etc, single general without units, …) but approximately it's something like this. AI has bonus 50% (50% lower costs), can be changed - parameter "AI Multiplier". Why bonus for AI ? AI "doesn't know" about this feature, it's not optimizing its armies & campaigns for low supplies costs. On every turn you can check your actual total "Army Supplies Costs" on Financial Scroll. "Army Supplies Costs" are deducted from King's Purse category. So, for example if your normal King's Purse is 1000 fl, and on Financial Scroll you've got Kings Purse= 280 that means your "Army Supplies Costs" are = 1000 - 280 = 720 florins. Example : On below picture (click to enlarge) you have small (1/4 size) Aragon army on long raid in enemy territory (8 turns). General has trait Army Size 1/4 (added by this modification) & SSHIP vanilla trait "Raiding in Enemy Lands" (Level 3, max). So "Army Supplies Cost" for that army will be 3000 x 1/4 (army size) * 1.00 (Trait Level 3 of 3) so about 750 florins. On Financial Scroll you see King's Purse = -80, normal is 1000 (Aragon) , so total "Army Supplies Costs" for all armies are 1080 florins. As player you are forced to plan your invasion & try do them very quick, because supplies costs are tremendous. Especially long sieges are painful (as in history), they're devastating your economy. It's worth to quickly assault walls, but that's hard, especially with Garrison Script enabled :-) . Such system favors factions defending in their own territory over aggressive factions (as in history). It's easy to defend (no additional costs), it's hard to attack & gain territory. If you want to execute large aggressive campaign yo need to prepare, accumulate money reserve. Or plan it to do it quickly. Or make quick move, take on settlement and go for peace. As in history. Long aggressive war is really really painful. This modification seriously affects world economy. All factions are charged with additional costs, on each turn substantial amount of florins 'leaks' from world economy due to supplies costs. Of course you can modify those base "3000" - it parameter in option, you can lower "AI MUltiplier parameter - ex: 0.1 meeans 90% bonus for AI, 0.01 means 99% bonus for AI (almost no costs). Another solution is to somehow boost world economy to fulfill supplies costs - you can do it with World Economy Scaling feature. World Economy Scaling feature is designed to counter this negative effect, all factions have + 7,5% of income. So you can safely use those both features, they're carefully tested. Through history, armies lacking of proper supplies suffered desertions, mass illness, mass deaths, lack of food for soldiers and horses, downfall of morale, etc. In general - lack of proper supplies resulted in reduction of army strength, reduction in total number of men, their combat effectiveness, morale, movement speed, etc. Such aspects are impossible or very hard to implement in MTW2 game engine. Successful supplies required careful planing, earlier collecting of large amounts of supplies, securing supplies routes, choosing right (sometimes much more longer) campaign route (ex: like Alexander campaign attacking central Persia from Egypt), etc. It's also very hard to implement in game (but Byg in BGR somehow implemented some aspects of it - collecting of supplies). I've decided to choose simplified approach - Army Supplies simple means more costs, more that just units upkeep costs. Only armies in enemy lands will be charged with additional costs. If you are in your own territory - no additional costs. MTW2 game engine is very limited and we are able only to 'discover' armies in enemy lands that are lead by general. So army without general in enemy lands will not be charged with costs. But most of the big armies lead by player or AI have generals, so don't worry. This modification discovers what is approximately size of the army lead by general. Currently I don't remember exact number (is it 14 or 15 or 16 to be full size), but this is done in logical way and tested. Army costs in enemy lands will be proportinally applied basing on above four army sizes.